They are just windows, but the very windows. It may sound a little strange. Sometimes something shows us a spefic meaning. 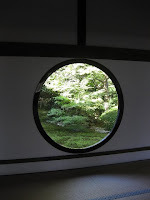 ﻿ When you enter the main hall of Genkoan temple, you will find two windows there.One is square and the other is round. The square one is called "The window of hesitation." 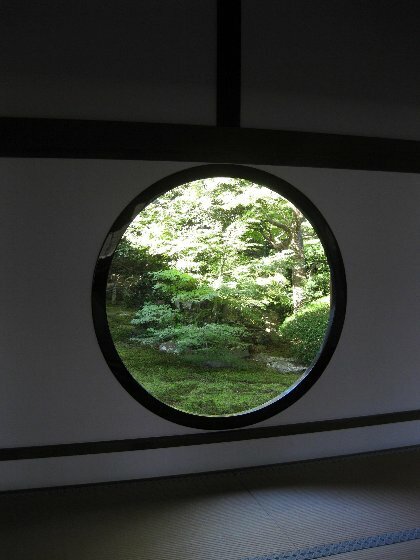 and the round one " The window of enlightment" Do you know why they are called so? Please look upward in that hall, and you will see a ceiling with some steins. What are they? How did it get them? 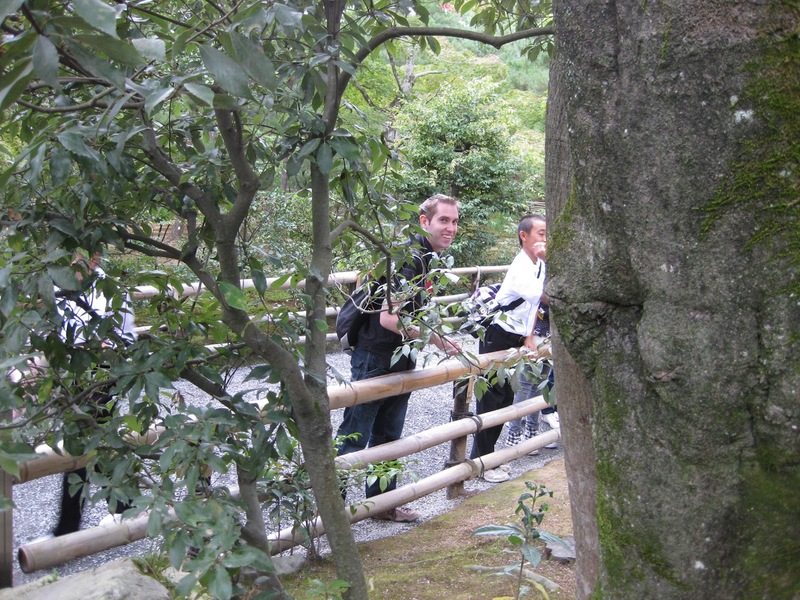 The surbordenate warlord of Ieyasu, Mototada Torii, had to stay in the castle to protect the castle from Mitsunari. Ieyasu offered him to leave more worriors for him to help after Ieyasu left there . 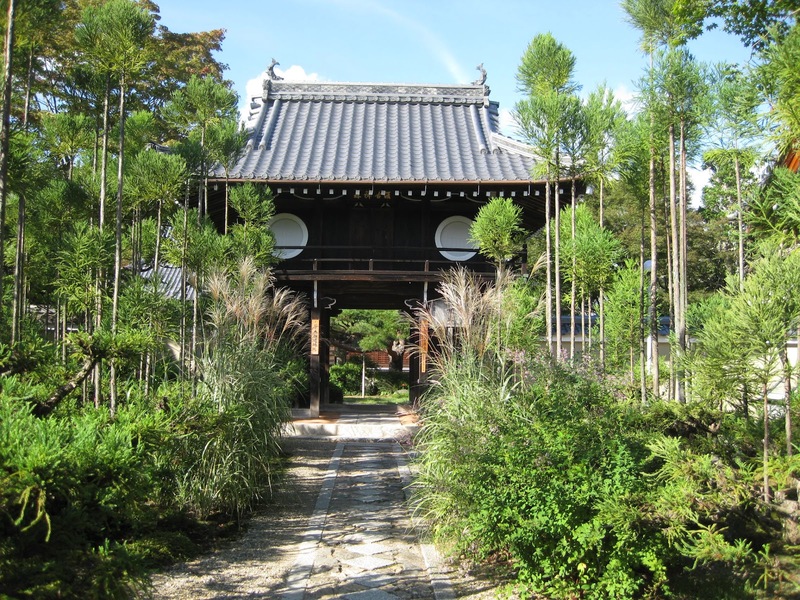 However, the warlord ( Mototada Torii ) cordially delined Ieyasu's offer, saying "No more unnecessary deaths". He knew he was going to die. 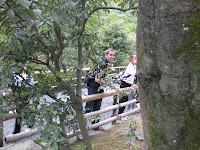 They drank some sake togather and spent a quiet time for farewell . Mototada and a small number of worriors bravely fought against Mitsunari army which consisted of 40,000 worriors. The fight was supposed to end in a few days but, in fact , it lasted for more than 10 days. The protest by Mototada troop against Mitsunari army was so strong that Mitsunari army could not help taking far more time than they had expected to end this fight. Motodata and his followers killed themselves at the last moment, and their bodies were left there for a while. The floor board was divided into several parts and now they are used as a ceiling in several temples so that the monks in those temples and we can pray for the departed souls. 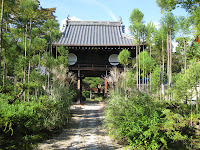 The other temples which have such ceilings are Hosen-in temple in Ohara, Yogenin temple, Shodenji temple, Koshoji temple, Shin-oji temple, Tenkyuin temple in Myoshinji temple, and Eishunji temple. 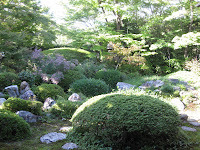 The Famous ones are Genkoan, Hosenin temple and Yogenin temple. Actually, on the board at the moment in our history, there were worriors who fought for Ieyasu by sacrificing their lives.